Polybloggimous: I'm An Old Fart...No, Don't Say I'm Not. There's Evidence! I'm An Old Fart...No, Don't Say I'm Not. There's Evidence! OK, first, I just watched a commercial and while I'm 90% sure it was meant to be amusing in that the people in it portraying cool people were, in fact, meant to be seen as uncool people doing a pale imitation of cool people, I'm only 20% sure why that was meant to be amusing in the first place. The preceding sentence is further evidence that I'm an old fart. For decades now, we've been promised picture phones. The only thing I wanted more were the flying cars (and they're not even on the horizon -- pun intended). Well, now there's Skype and it's pretty much a picture phone. You and the people you're talking to show up as little grainy icon sized pictures on each other's computers or you can make the picture bigger, in which case -- well, it's bigger, but you could either be talking to the person you think you're talking to or you could be speaking to Babar the Elephant wearing a yellow liesure suit and a purple fedora. Fine. I've now spoken on Skype a few times...and it scares me. 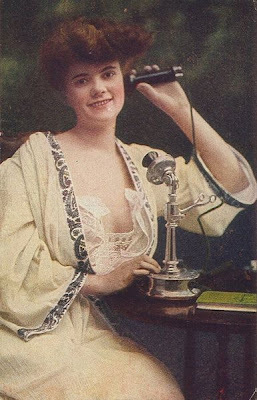 The first problem is one that was associated with speaking on the telephone in the early 20th Century. Odds are, you had nothing in particular to say, you just had to use the damned thing for the novelty of it all. Those people had it easy. They just heard each other not having anything much to say. In the case of Skype, not only am I heard to have nothing to say...I'm seen dithering as well. And it's really a lot more limiting than I expected. You can't pick your nose. You can't fart. I know what you're thinking -- the person at the other end isn't any more likely to hear it than they were on a telephone, and there's no smell-a-vision involved. True, but that cheek-lift you'd do on the phone to help silence the fart is now visible as a rising of the entire left side of your body. At the very least, you'd look spastic as hell. And I'll be honest -- I've peed while talking to people on the phone. Oh, tell me you haven't! But you do it as quietly as possible, aiming for the porcelain, not the water. You wait to flush until after you hang up. Can you get away with that on Skype? I think not! The only way this is going to work out for me is if they make it so I have control over which sized picture you get to see. Everything will be fine if I can enlarge your view so that you think you're just looking at a potato wearing a feather boa...lifting one cheek. The vast majority of my skype conversations have consisted of variations on the theme of "can you hear me now?" "And I'll be honest -- I've peed while talking to people on the phone." Yes, must be a guy thing, caught one of my closest guy friends (and former roomie) doing that very thing! When I called him on it, he called it a sharing experience!! Wendy, it's not a guy thing. At work there are always girls (ie female students) in the restroom talking on the phone. I usually flush multiple times, not that it seems to matter.